Vaccination has revolutionised control of infectious disease in our pets. 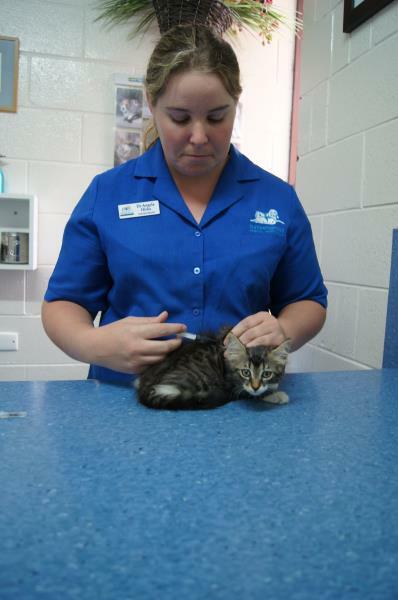 It is essential that all pets are adequately vaccinated to help protect the pet population as a whole. Responsible pet care requires kittens to be given their initial course of vaccinations, but this cannot protect them for the rest of their lives. Adult cats require yearly vaccination boosters to maintain their maximum immunity against disease. Kittens are ‘temporarily’ protected against many diseases by antibodies received through their mother’s milk. These maternal antibodies decline in the first couple of months of their lives, however until they drop sufficiently they can also neutralise vaccines. A series of vaccinations is necessary for a kitten because the level of antibodies each kitten gets from its mother in the first 48hrs of life determines when it will respond to a vaccination. We follow the World Small Animal Veterinary Association recommendations when it comes to your kittens vaccination regime. The first vaccine is recommended at between 6-8 weeks then 10-12 weeks and the last vaccine as a kitten must be given at 16 weeks. It takes 2 weeks to respond properly to the vaccination. They are then covered as well as that individual can be for a period of time, and the recommendation for booster vaccinations is at their first birthday, in which we do a full physical check-up & boost the vaccination. The immunity from kitten vaccination weakens over time and your pet can again become susceptible to disease. Yearly health checks to check for other developing problems and booster vaccinations will provide the best protection for the life of your pet. If your pet misses a vaccine scheduled then an additional booster vaccination may be required. Following vaccination your cat may be off-colour for a day or two, or have some slight swelling or tenderness at the injection site, but this should be mild and is quite uncommon. Access to food and water and a comfortable area to rest are usually all that is required for a quick recovery. However, if the response seems more severe, you should contact us for advice. It is the cat form of parvovirus in dogs. Feline respiratory disease affects cats of all ages, especially young kittens. It is seen more in multi cat households & cats that roam. It is a highly contagious virus which causes sneezing, coughing, runny eyes, nasal discharge, loss of appetite and tongue ulcers. Fortunately, the death rate is low unless there is secondary infection with bacteria, except in young kittens, but the disease is distressing and may persist for several weeks with treatment aimed at the secondary infections, as there isn't any highly effective treatment for the viral disease itself. Vaccination protects or at least greatly limits the signs and time taken to eliminate the disease, depending on the individual cat. Recovered cats can continue to carry and spread the infection for long periods, and can show signs of the disease again if they become stressed. Vaccination doesn't prevent infection but does minimise the signs shown. Kittens are more severely affected by Chlamydia when also infected with “Cat Flu”, and Chlamydia can be shed for many months. Vaccination against cat flu and Chlamydia helps protects against clinical disease. An antibiotic can be used to directly treat this organism, and being previously vaccinated can help reduce the time taken for signs to be resolved and shedding of the chlamydia to stop. The virus attacks the immune system and may be associated with lack of appetite, weight loss and apathy, pale or yellow mucous membranes, vomiting, diarrhoea, reproductive problems, increased susceptibility to other infections (Immune suppression) leukaemia (a blood cell tumour) and other blood cell tumours. Many cats may be infected , fight the virus off successfully and show few or no signs at all. There is no reliable effective treatment against the virus itself. In some countries there may be a link between vaccination against this virus and a certain severe tumour, which doesn't appear to be the case in Australia. If you suspect your cat is showing any signs of FIV or FeLV we can perform an in-house blood test to determine if they are positive for these diseases.